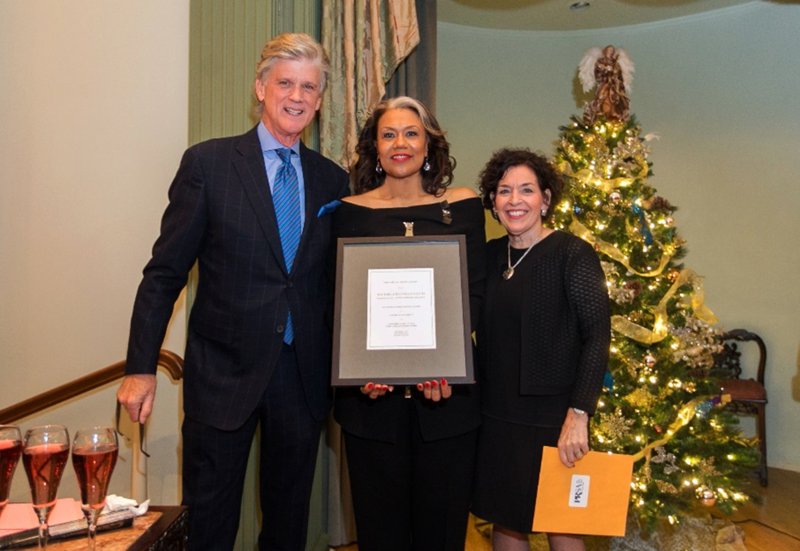 Michelle Flowers Welch, founder and CEO of Flowers Communications Group, accepts the 2017 Distinguished Senior Leader Award by the Public Relations Society of America Chicago Chapter alongside event co-chairs Rich Jernstedt, CEO of The Jernstedt Company and Bridget Coffing, formerly of McDonald’s. Ever since I was a little girl, I have wanted to have my own business. I didn’t know what it would be, but my father, who gave up his own entrepreneurial dreams, to raise six children, really inspired my entrepreneurial dreams. And I know that he is with me right now in spirit, sharing in this special moment. And my mom is right beside him because when they were alive, they always traveled together. I want to spend just a few minutes focused on the work that I am passionate about, my work in the multicultural space that I am being honored for this evening. My message can be summed up with this: #MulticulturalConsumersMatter. That is the heartbeat of the hundreds of campaigns that Flowers Communications Group has created over the past 26 years. We have been laser-focused on building strong connections between our clients and African-American, Hispanic and Asian consumers. And while that’s what we do, let me tell you a quick story that motivated my journey. 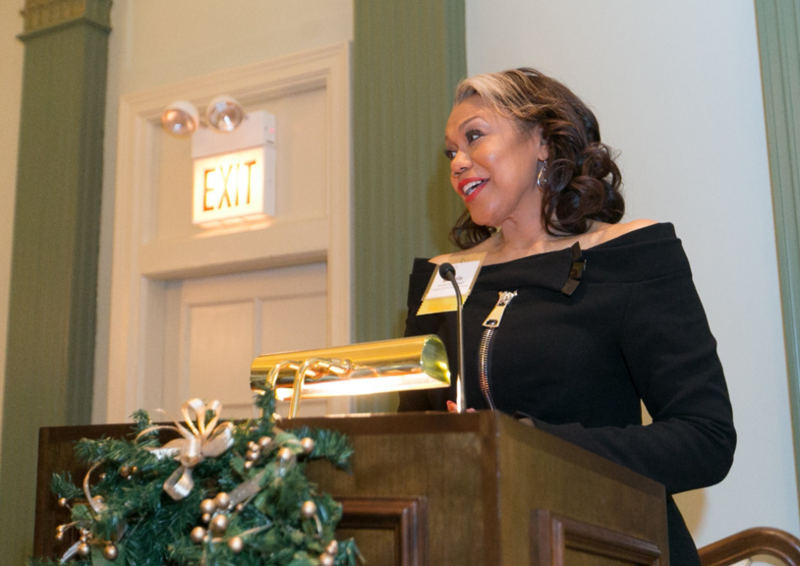 When I moved to Chicago after graduating from college, I would often drive around to get to know the city because it was important to the PR work that I did for the Chicago Urban League. Well, one day, I got lost in what was apparently the wrong neighborhood for someone who looks like me. For the first time in my life, I was called the “n-word” by a group of young white kids riding on their bikes. They jeered at me and threw rocks at my car, and I was stunned and amazed by such racial hatred in a city that I naively thought was more progressive than the South, where I was raised. That incident, coupled with my experiences at the Urban League, really fueled my desire to do something with my life that would make a difference and help improve our communities. When I look at the body of work that Flowers Communications Group has done, I am quite proud. There are more African-American and Hispanic entrepreneurs, more black children excited about education, more Latino families focused on health, more people headed for a better future because of the work that we do that harnesses the power of PR. So it’s a great time to be in multicultural marketing, right? After all, multicultural consumers are driving 84 percent of the population growth and we account for 43 percent of buying power in the top 10 markets. Nielsen calls us “Rising Super Consumers” who drive the mainstream, create social trends and influence pop culture. There are some iconic brands who get it, and they lead with authentic, innovative multicultural marketing communications. However, just this year, in this day and age, we have seen too many racially-insensitive communications fiascos by major brands that will go unnamed this evening, in case some of you are on their PR teams. There was the skin care company that produced a horrifically offensive commercial with the image of a white woman and the tagline, ‘white is purity.’ Then there was the indefensible beverage ad that downplayed police violence, which too often, is a very real, frightening issue in communities of color. The ad implied that social injustice could be fixed with a can of soda… or there was a very recent body wash ad that showed a black woman removing her top to turn into a white woman in an effort to celebrate diversity. There was no regard for #MulticulturalConsumersMatter! Yet, in many ways, despite the dramatic changes in our world, with the dominance of technology and the power of social media, new methods for geo-targeting and engaging consumers, the fight in the multicultural space continues. When I started the agency, the challenge was to help clients gain a greater understanding of the need for multicultural marketing, but now there are new challenges. There is the economic challenge of securing budget to support the work. There is the challenge of getting brands to recognize that multicultural agencies can lead their work. Or in too many cases, there is the still the challenge of getting our voice heard at the table, of being involved in the strategy, and providing expertise from the multicultural lens to help prevent racially-explosive PR fiascos. The good news is that as I look around the room, I see so many accomplished senior leaders with the power to affect change. I have had some long, poignant conversations with some of you. Chicago is the epicenter of excellence in our industry. Just think about all of the nationally known pioneers and innovators in PR who have Chicago roots. PRSA Chicago – as leaders and game changers in public relations and communications, we must continue to fulfill our mission of advancing our profession. So, I want to leave you with the charge of advocacy to move our industry forward with a genuine commitment to #MulticulturalConsumersMatter. Do what you can to advocate for multicultural strategic expertise at the onset of your programs. Advocate for the investments and budgets to do great, impactful work. Be bold enough to have a multicultural agency lead a total market campaign that’s driven by ethnic market insights. These actions can truly take our industry to the next level and serve us all well. You have that power, and I encourage you to use it. If not now, when? Flowers Welch surrounded by well-wishing current and former employees who joined in the celebration. From Top Left: Brienna LaCoste, Katrina Parker, Leisha Nicol, (Michelle) Adorn Lewis Mitchell, Kim Rudd and Danyele Davis. 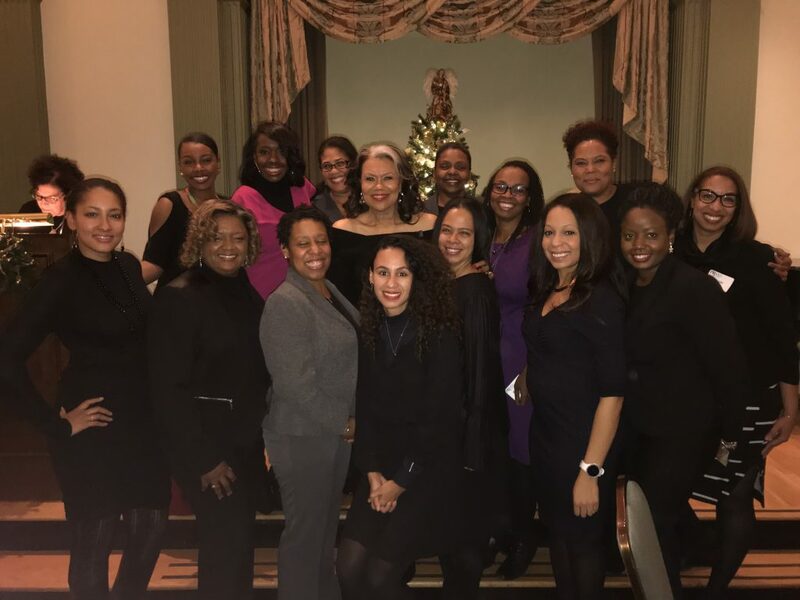 From Bottom Left: Christina Steed, Wanda Taylor-Ward, Karen Malone, Vanessa Flowers, JeNyce Boolton, Chantal Randall, C. Nicole Pierce and Nicole Neal.